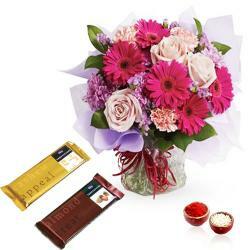 Product Consists : Hand Bouquet of 12 Mix Colorful Roses, 500 Gms Dry Fruits along with Free Roli Chawal. If you are looking for splendid gifts to treat your brother to on special occasion of Bhaidooj then here is a wonderful hamper for you. 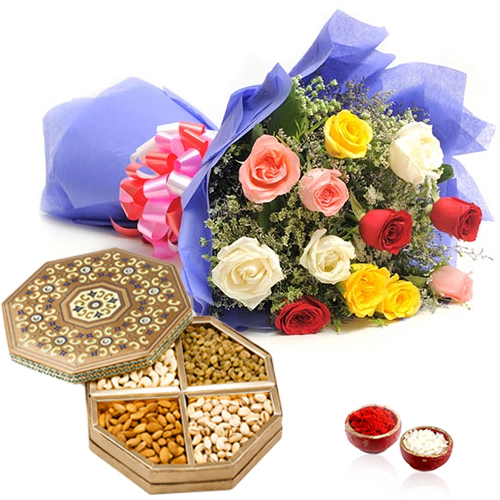 This is a classy gift set that consists of 500 Gms assorted dry fruits like almonds, cashew nuts and so on packed in a Box with Fresh Mix color flowers and green filliers. 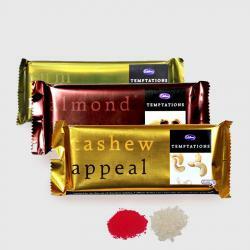 This year, celebrate Bhaidooj by treating your darling brother to nutritive dry fruits. The Roses Bouquet and Dry Fruits that are so important for Bhaidooj celebrations make for an ideal gift to greet loved ones with best wishes of love and light. 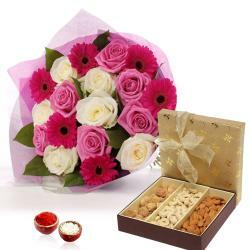 Product Consists : Hand Bouquet of 12 Mix Colorful Roses, 500 Gms Dry Fruits along with Free Roli Chawal.